"30 Days of Cidewalk Stories"
To celebrate the spirit of entrepreneurship, this holiday season we are kicking off the "30 Days of Cidewalk Stories" featuring one story a day throughout November. What's Your Story? I started a non-profit organization that crafts dogs out of reclaimed wood, also known as Rondellhund. All proceeds are donated straight to Make a Wish Foundation & Childrens Cancer Research. 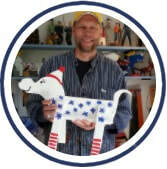 ​The idea to make Rondellhund was born after I built my woodcarving workshop. I had trouble finding inspiration for something to carve in my new workshop. I began to play-around with all the wood left after building the workshop. I stumbled across the Rondellhund concept, made a couple prototypes which put smiles on the faces of my family and friends. This encouraged me to continue exploring the idea of Rondellhund. My current challenge is to find a way to double my donations year to year. I hope to find the growth via digital sales which I have yet to explore. Events/Craft shows are great places to grow my business but the growth is limited. When dealing with charity based products promotions can be a very tricky subject. One wants to maximize the amount of money that comes in so that the charity gets more but spreading the word is just as important for the cause. In the future, offering a slight discount for purchases of multiple Rondellhund or referrals would be interesting try. Reach new customers where they are already looking.. on their phone. With Cidewalk Mobile ads you can reach thousands of users a month on their phones. What types of ads do people typically click on? Coupons and discount offers! Promote yours today. With Cidewalk both your customer acquisition AND customer retention goals can be achieved with our Mobile Ads and Text Message marketing services all in one place. Text marketing is the most powerful way to inform and engage your customers about your deals and services. Becoming a marketing expert is easier than you think, and all you need is your cell phone.